It’s easy to forget about her the rest of the year, but Anchorage’s unofficial mascot gets a lot of attention around the holidays. 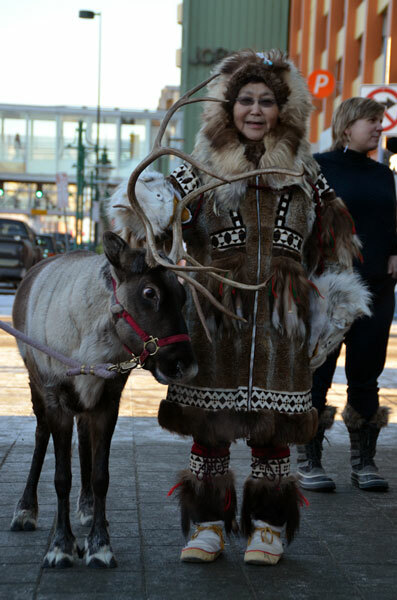 KSKA’s Daysha Eaton takes a walk around town with Star the reindeer. This reindeer is a stout animal with a cocoa colored coat and a fluffy white ruff around her neck. Her antlers have 5 or 6 points on each side and span more than 2 feet. She lives at the corner of 10th & I street in downtown Anchorage. That’s Albert Whitehead, harnessing up the reindeer for a walk on the park strip, something he does regularly. He is the caretaker for Anchorage’s most famous reindeer, Star. “There’s one reindeer here now, she’s called Star, but she’s the 6th reindeer named Star – which is another long story, if you have time,” Whitehead said. Whitehead is full of stories. He has helped take care of many of Star’s predecessors. “Star 1 lived to be 22 years old. Star 2 was stolen and killed. Star 3 inadvertently ate plastic bags. Star 4 lived to be 18. Start 5 was a young one who had a short experience and died the same week Mrs. Stewart died,” Whitehead said. 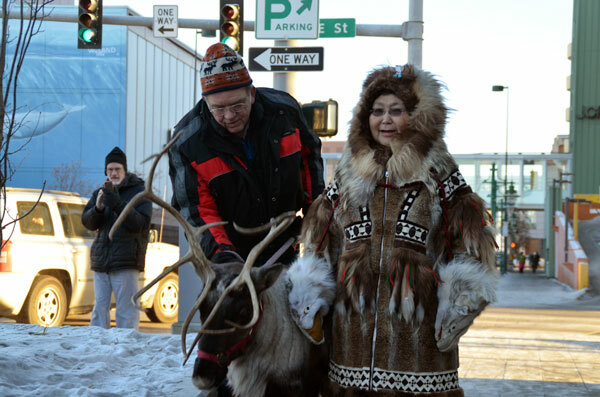 Mrs. Stewart was the one who brought the first pet reindeer to downtown Anchorage. Whitehead came to Alaska in 1960 with the service. Shortly after his arrival, he met Ivan and Oro Stewart, the owners of Stewart’s Photo Shop and began working for them part time. Over the years he evolved into their reindeer helper, particularly after Mr. Stewart died in 1986. “And upon Mrs. Stewart’s death I found that she left me a life estate as long as I took care of her reindeer and some other things that I had to do,” Whitehead said. Whitehead decided to carry the tradition on, at Mrs. Stewart’s final request. Reindeer are not Native to Alaska. Reindeer are shorter, stouter and don’t migrate over long distances like their cousin, the longer-legged caribou which is Native to Alaska. Reindeer were first imported to the Seward Peninsula from Siberia in 1892. Whitehead says the previous pet reindeer were all leased by Mrs. Stewart from Western Alaska Native herds but Star 6 came from a reindeer farm in Palmer. She will be 11-years-old in April. It doesn’t take long before smiling people nearby abandon wherever they’re going and stop to visit with Star. “Hi folks how you doing? Wow, hi there, it’s so nice to see you. We’ve heard about you actually,” they said. Star the reindeer posing with Albert Whitehead. Photo by Clark James Mishler. Kelly McHugh works at the Smithsonian’s National Museum of the American Indian in Washington D.C. She’s visiting Anchorage. “We had heard about Star – our colleagues at the Smithsonian’s Arctic Studies Center at the Anchorage Museum told us about her. And that she stays, that she’s very friendly sociable – a fixture in Anchorage. It’s like thrilling to see her on the street!,” McHugh said. It’s a bit like walking around with a celebrity, Whitehead says. Strangers faces light up. “I think people are more open. They just come up, they want to talk about — who is she what is she, what’s her history, how does she behave. It’s a conversation piece,” Whitehead said. We bump into Meg Smith near the park strip. She grew up in Anchorage and remembers vividly the first time she visited a Star the reindeer in a downtown enclosure when she was 8 in 1976. “It was such a treat to come downtown to go to the fence and to see it. It’s a wild animal and you are in an urban area. And to see it walk on the sidewalk — it’s a beautiful thing,” Smith said. Star is beautiful, but not really wild. Reindeer originated in Eurasia and were domesticated anywhere from 2-10-thousand years ago. Humans selected for certain characteristics. As a result, Reindeer are fairly docile. Whitehead says they are very quiet animals. The only sound they make, very rarely, is a low grunt. As we continue our walk downtown, we hear the clicking of her hooves on the pavement. “Now you know where the song about, click, click on the rooftop at Christmastime — that’s where that came from right,” Whitehead said. The clicking of reindeer hooves — something most kids dream about this time of year, but here in Anchorage there’s reindeer magic all year round.